On 15 March, in 1,000 cities and 100 countries, millions went on strike and demonstrated against the huge threat to the environment and human populations posed by rapid climate change. These protests, against the failure of capitalist governments to agree meaningful environmental policies, were led by young people, in particular school students. 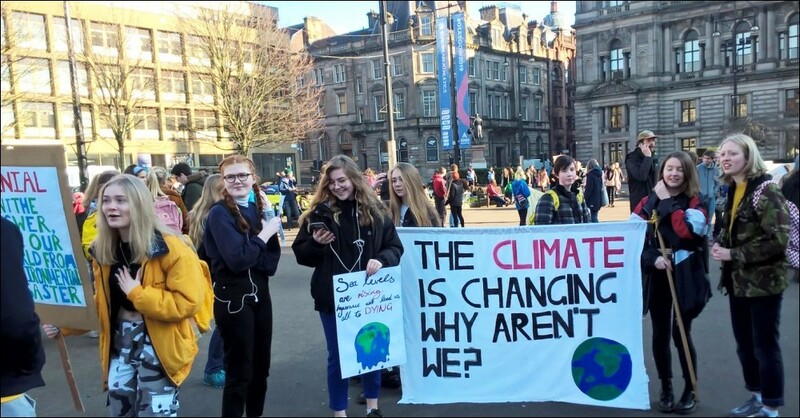 This is the generation which will bear the brunt of catastrophic global warming due to greenhouse gas emissions from profit-driven capitalist industry, transport and agriculture. The Socialist Party and youth groups Socialist Students and Young Socialists - along with our socialist counterparts internationally in the Committee for a Workers' International (see reports on socialistworld.net) played an important role in building the 15 March protests and will continue this effort in the next round of protests. 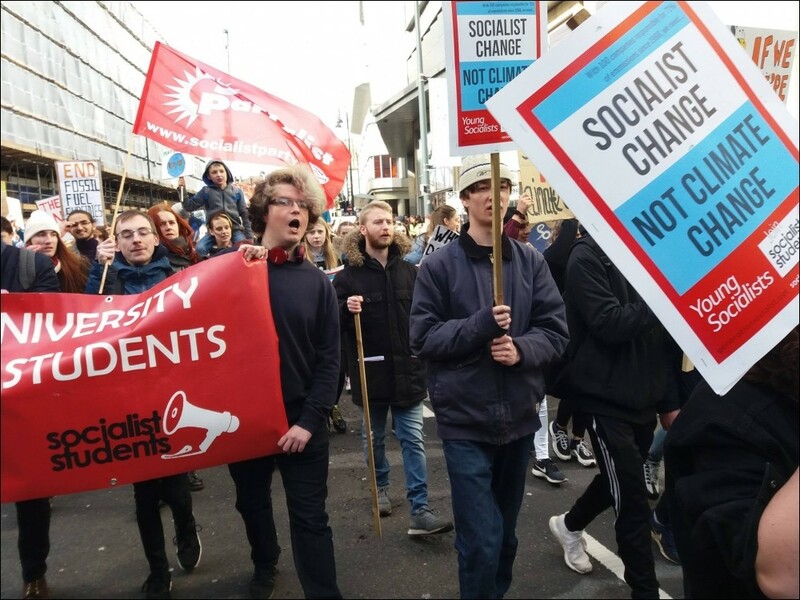 Socialist Students is calling for the creation of school and college student unions to help students coordinate their next walkouts on 12 April and, importantly, to defend the right to protest. Hundreds of students signed up to Socialist Students for help with setting up such unions in the run up to 12 April. Socialist Students also wants to take the movement forward by linking it in struggle with the working-class majority in society. 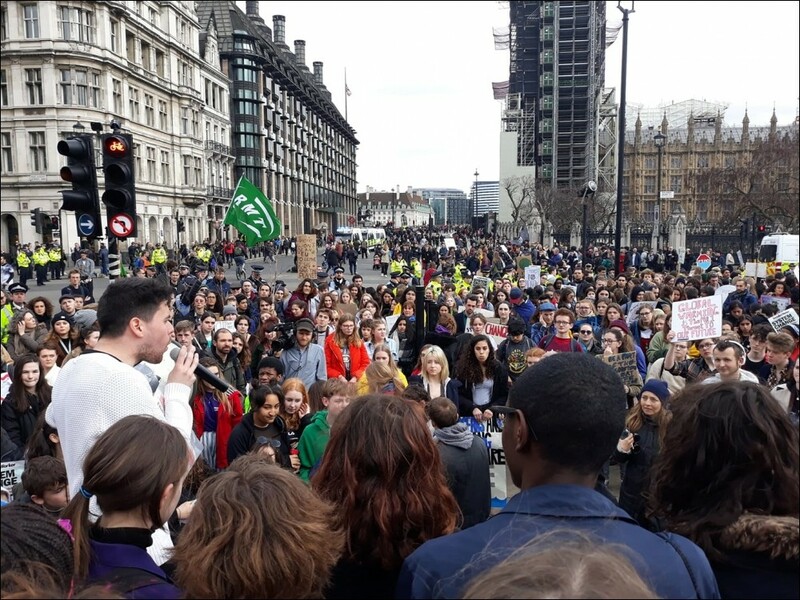 Students pointed out on our open mic in London that it will overwhelmingly be working and middle-class people who pay the heaviest price if climate change continues unabated - through food and water shortages and climate-related poverty. The super-rich - including last year the Kardashian-Wests in California - have the resources to protect their property, hiring private fire services to keep their mansions safe from wildfires. Working-class and young people are not so fortunate under similar circumstances. That's why Socialist Students is calling for the trade unions to help organise and steward local protests on the next round of school strikes. 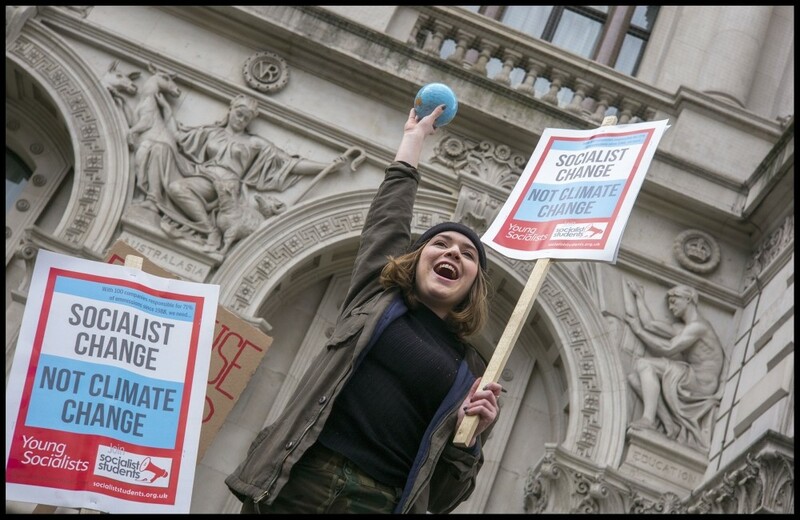 In London, well over 200 students left their details with Socialist Students to be put in touch with local trade unions and trade union councils for assistance with organising joint students' and workers' demonstrations against climate change in their local areas and towns. Socialist Students is now setting out to officially establish local student unions to help organise students who want to build this movement, and will be looking to hold founding meetings of student unions over the coming weeks. But we now must extend our movement by appealing to the trade unions, through new student unions or as Socialist Students, to weigh in on this battle. We want to put central to this movement our demand that the Tory government is kicked out and replaced with a Corbyn-led government - a government which nationalises, under democratic workers' control and management, the big polluters, the energy companies, and the commanding heights of the economy as a matter of urgency, to introduce a socialist economic plan to halt and reverse climate change. 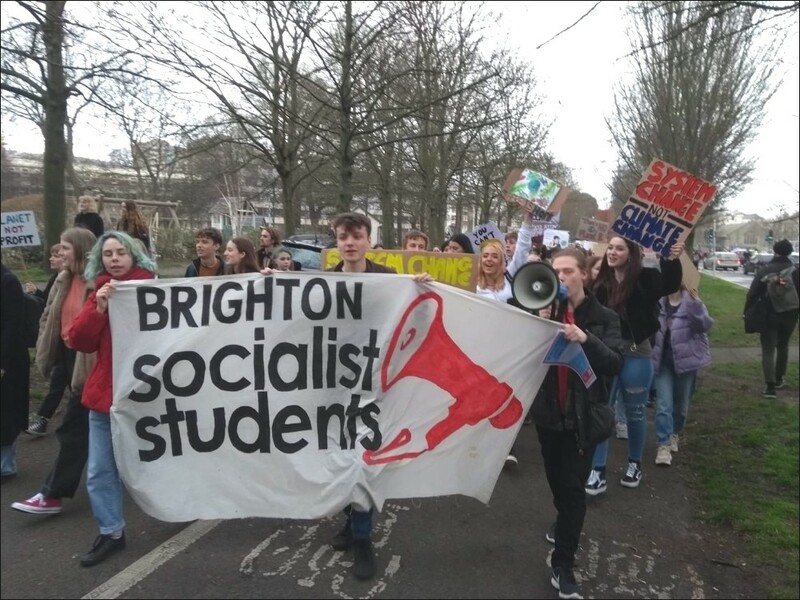 Defying threats of school fines and detentions, a huge turnout of around 3,000 students and young people marched in Brighton against climate change - more than double the attendance of last month's demonstrations. Many students recognised the need for system change, and our specific slogan - 'socialist change, not climate change' - was well received. They were also enthusiastic about our call to form school and college student unions to organise the fight back, especially with the example of the recent strikes of our sister organisation in the Spanish state (see pages 14-15). Young people across the country are realising that the Tories and the current capitalist system provide no solutions to the pressing problems we face, and in fact are the problem! Some of the biggest chants were "Tories out" and "oh Jeremy Corbyn". 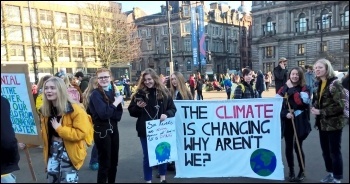 From across the west of Scotland the second #youthstrike4climate drew 1,800 people to George's Square in Glasgow. Many of the demonstrators were primary or secondary school students, as well as those in third-level education. Young workers were also present, with Unite the Union, the RMT and Glasgow Unison representatives all in attendance. The protest was lively and colourful with many banners. The joint Socialist Party and Socialist Students stall was busy all morning, with many young people signing our petitions demanding nationalisation of the energy industry and taking up other climate issues. Socialist Students and Socialist Youth will be assisting school students organising for the next strike on 12 April. It is important to stress the potentially huge role that the trade unions could play in this developing environmental movement. To start with, we suggest calling on the teachers' unions to assist in the organisation of demonstrations and strikes at their schools and fight against any attempt to victimise striking school students. Students and young people in London once again filled Parliament Square - this time much bigger and even more vibrant. Throughout the day, students and young people marched back and forth to Trafalgar Square and Buckingham Palace. Holding their homemade placards as they marched, they called for immediate action to address climate change. Trade unions, such as the RMT, were also present during the protest, giving support. Socialist Students, aware of the importance of democratic debate to build this movement, set up an open mic to engage with young people about how we can go further. This proved to be very popular and a massive crowd formed around the 'red' sound system. Although there was a wide spectrum of ideas, there was one argument that almost all agreed on: only mass action from below, linking up with trade unions and disrupting not only the traffic but the whole economy, has the potential to halt climate change. Many agreed that profit-oriented big businesses would do nothing to halt climate change - and some students chanted "socialist change - not climate change". More than 200 people signed up to Socialist Students to hear more from us. Many young people said they want to campaign in their schools and colleges to build for the next climate strike. We told them that we would be more than happy to provide materials and any other support they need. 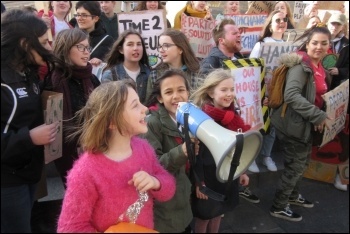 Around 1,000 young people gathered outside Birmingham Council House for the climate strike demonstration. 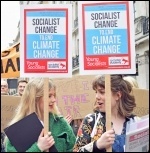 Socialist Students provided a socialist approach to combating climate change. The march itself was short and sweet, plenty of noise, chants, whistles and handcrafted signs, all with an air of cheerful resistance. Many bystanders were enthused that young people were taking action and an older man who'd asked for a leaflet proudly told me that he was a lifelong socialist and expressed his solidarity to the school strikers. Many marchers talked about how the reaction by their schools wasn't too positive and they'd been threatened with detention - but it was quickly pointed out, if my school is underwater, detentions aren't as feasible anymore! More than 60 people signed-up for more information. School students bought copies of the Socialist with their lunch money and every single leaflet handed out, the day was a resounding success. Around 200 young people braved the wet weather, taking to the streets to demand climate justice. In the main square, university and school students stepped up to our megaphone to share their thoughts. Socialist Students had a strong, visible presence, and our placards were popular among the crowd. We marched through the city centre to the Guildhall behind a Young Socialists banner and led various chants which were enthusiastically picked up. We also distributed leaflets promoting our meeting on 20 March to discuss socialist solutions to climate change. At the Guildhall, the local climate strike movement demanded the council declare a climate emergency and disinvest from fossil fuels. 500 young people assembled outside St George's Hall. While, as before, there were calls not to 'politicise' the event, the baleful role of capitalism in causing climate change cannot and did not escape people's notice. Many of the young people carried homemade signs naming capitalism as the culprit of the world's pollution and carbon emissions. 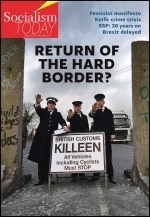 Socialist Party members had a stall and distributed leaflets. 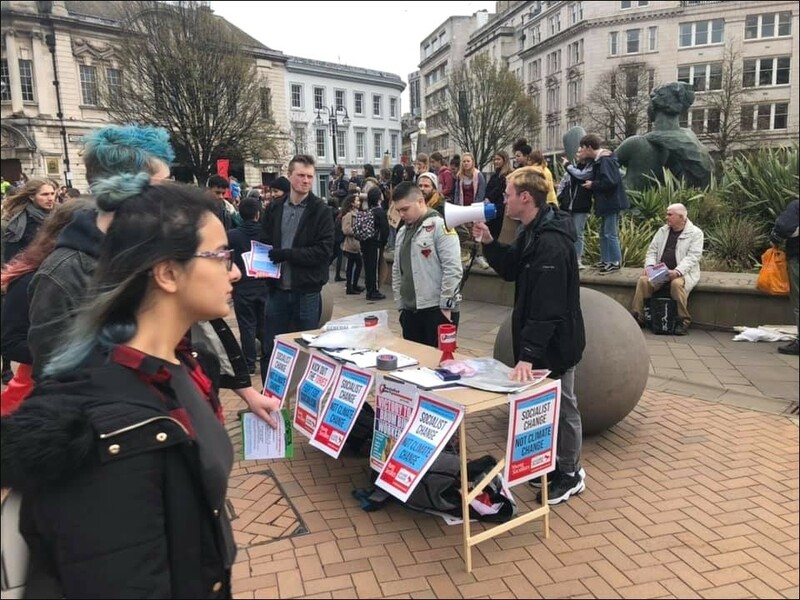 Liverpool Socialist Students campaigned for the demonstration, as well as holding a meeting where some of the organisers of the protest spoke. Party members have also been involved in Wirral Extinction Rebellion meetings. After listening to speakers the march set off making plenty of noise and grabbing the undivided attention of shoppers before holding a second rally at Derby Square. Entering the square we were greeted by members of PCS civil service union, including assistant general secretary Chris Baugh, who were protesting in support of cleaning workers to coincide with the climate strike. Their message of solidarity was well received. Among the speakers who addressed the demo in Derby Square was former Liverpool 47 socialist councillor Tony Mulhearn, who was loudly cheered and applauded. With these combined interventions of Socialist Party members, Socialist Students and trade unionists, we sought to raise the need for the movement to link up with trade unions and the need for socialist change in order to fight climate change. Chants of "Hey, hey, ho, ho, climate change has got to go" and "when May tells us climate lies - we fight back and organise," echoed around Newcastle city centre. School students marched from the Monument towards the civic centre, where they met students from Northumbria University. Then back to the Monument for speeches and chanting, followed by a march around the block, then more speeches and chanting at the Monument! Our Socialist Party and Socialist Students open mic was greatly appreciated. Our message - that to end climate change, you need socialist change - gained an echo. Some students said they faced sanctions from their school for joining the strike. We said they need to learn the lessons from the 2003 anti-war movement, where students also faced sanctions. Our suggestion that any school, college or university which threatens to punish students should have protests outside. This got a huge response. Over 300 students, parents and activists gathered in Plymouth city centre, more than treble the size of the February climate strikes. The crowd was buzzing with energy and determination. After initially gathering outside the council offices the youth quickly turned the assembly into a marching demonstration. The students were defiant when asked by council security to move off council property back onto the public walkway, responding with: "We are the public and this is our property"! 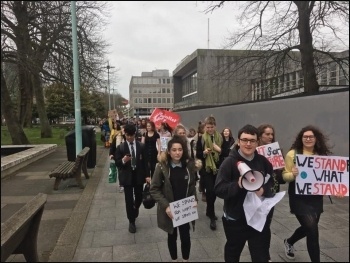 Shortly after moving off, the students stopped traffic in Plymouth city centre for a short time and then marched through the shopping mall, braving the mall security who quickly conceded defeat! After once again stopping to assemble, a number of students and parents gave heartfelt speeches as to why they were protesting. Socialist Party organiser Ryan Aldred was met with cheers when he emphasised that the current system was unsustainable - with politicians and corporations needing to be held to account. The demonstration was finally led to the office of Labour MP Luke Pollard who was greeted with boos when it was revealed that he had failed to attend a recent climate change debate in parliament. The energy of the demonstration quickly dampened when addressed by Pollard, and many students voted with their feet and left. They were however, much more enthusiastic about the Socialist Party's idea of forming strike committees to prepare for the 12 April strikes. 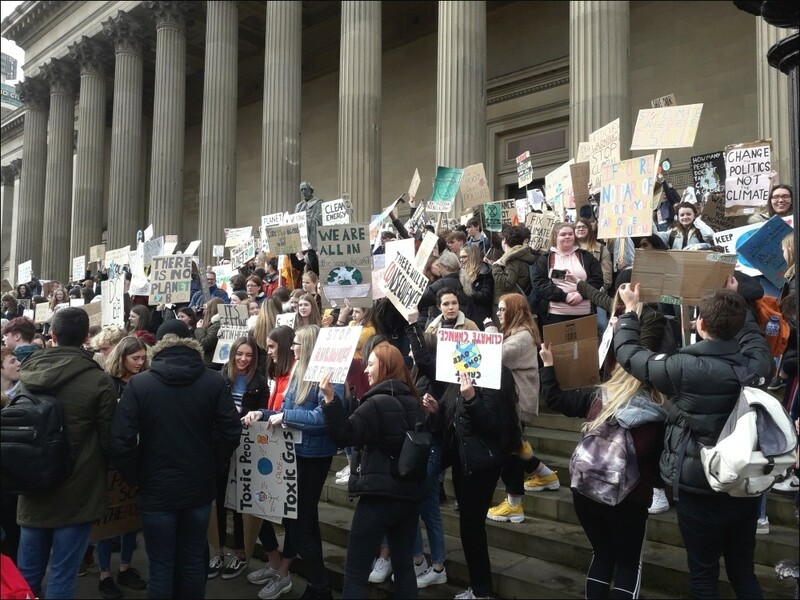 Outside Leeds Town Hall, Victoria Square was packed with around 1,500 protesters, where students of all ages walked out of their classrooms, carrying signs and placards, to make their voices heard. Spirits were high, and the crowd was determined. Both the Socialist Party and Socialist Students had a good showing, with a stall, leaflets and badges. Passers-by were stopped by the chanting of the assembly and took pictures of the placards. Some took on a humorous tone, "Spill tea not oil", "Clean up planet Earth, it's not Uranus"! Others were more serious: "System change not climate change", and "There is no Planet B". Around midday the assembly marched through Leeds, chanting and cheering, while onlookers voiced their support. We marched behind our banner and lead the chants. 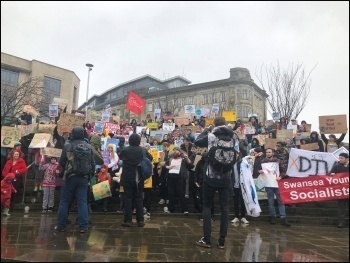 300 hundred school and college students walked out of classes throughout Nottinghamshire and Derbyshire, braving heavy winds to march from Trinity Square through Nottingham to outside the city council offices in Market Square. A sixth-former from Derby, who described himself as a socialist, spoke of how "we need a complete change in how the economy works". The loose youth strike movement, ignited on 15 February, has produced a manifesto which includes some good points, such as lowering the voting age to 16. However, it doesn't link real action on the environment to the need of all sections of the working class to mobilise together and sweep aside the large corporations, which continue to squander resources and pollute, and the governments which represent them. We proposed that every school and college set up Young Socialist groups as part of their climate meetings - which could coordinate nationally, ultimately internationally and give greater democratic accountability. Additionally, we demand the trade union council call a lunchtime walkout on 12 April that could connect the labour movement with a new generation eager to fight. Over 100 students protested at the Clock Tower, then marched to Jubilee Square. When we got there a student steward shouted at me and told me off for handing out leaflets for Leicester Young Socialists as they said the event wasn't meant to be political. Climate change is a political issue. Capitalism always prioritises profit over the planet. This is why the only solution to global warming is a socialist fightback. More than 200 protested. Most were young and included school students. Keele and Staffs University students along with workers from Unite, PCS, National Education Union, and other unions also marched. Some local schools reportedly had assemblies on climate change and the youth strike with teachers endorsing students to attend the protest. Socialist Party and Socialist Students members also helped build the protest with clear socialist demands. Our leaflets also had suggestions on how to make April's demonstrations even bigger, including how to link up with the trade unions. Students as young at eleven were attending with parents, urging that our future cannot be jeopardised through another generation of destructive fossil fuel reliance. There were, however, attempts to 'depoliticise' the strike. Certain environmental groups limited themselves to vague talk about simply 'acting' on climate change. This didn't stop many students from talking about the need to kick out the Tories and to put the 'planet before profit'! Our socialist ideas were received with keen interest. A positive mood exists on these strikes for system change. We argued that to take immediate action to halt climate change, we have to take on the profiteers that drive the fossil fuel industry. This means socialist change, based on workers' democracy and public ownership - not a false 'green' capitalism! My argument that capitalism has no answer to halting catastrophic climate change and that socialism is the way forward, were met with loud applause. The students also applauded the motion passed by the TUC in support of their action. 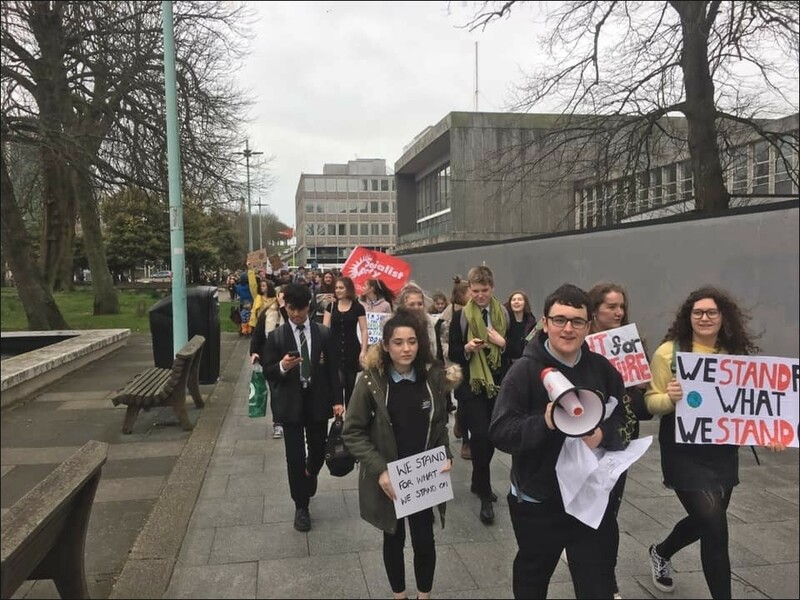 From nothing a month ago, there was a gathering of over 200 mainly school students in Worcester city on 15 March. There were a couple of speeches at the start along with a minute's silence for the victims of the mass shootings in New Zealand.